The classic supply-demand graph nearby is common fodder for industry professionals who know that times are good when the national vacancy rate drops to new lows following leasing demand that convincingly exceeds supply. We can end the story there by subscribing to the idiom above, but to do so comes with the risk of overlooking the latest, impressive chapter. 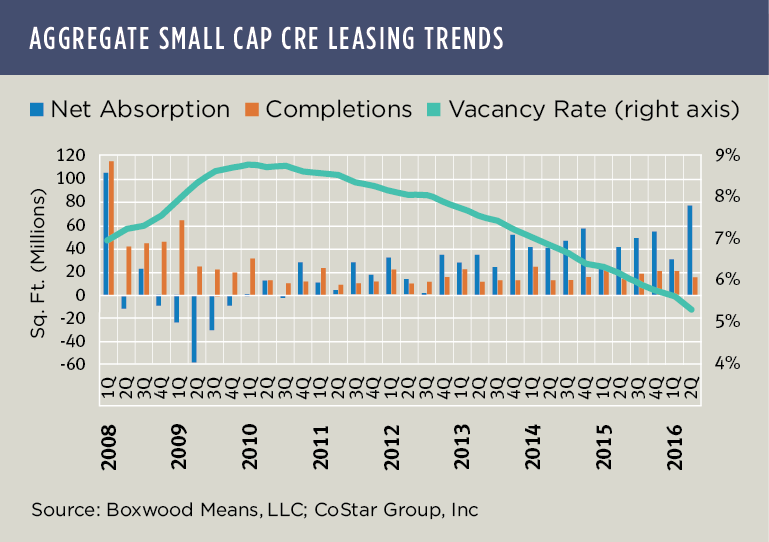 The fact is that small cap CRE fundamentals are at a momentous point in the current cycle because of favorable, if not restrained U.S. economic growth over a long period of time. The economy added over 2.5 million jobs last year, the second best year for job gains since 1999, and June's surge in job growth dispelled most fears that the economy was stalling seven years into the recovery. Also, wages are modestly increasing, job openings are at a record-high and consumer spending is robust. These are primary factors stoking a small cap CRE expansion that is underscored by some breathtaking numbers that may escape the casual glance at a graph. For example, second quarter marked 23 consecutive quarters of positive demand topped off by a whopping 76.1 million sq. ft. of net absorption - a gain of nearly 90% YOY and the second highest total since the 104.4 million sq. ft. during fourth quarter, 2007 according to our analysis of CoStar data covering office, industrial and retail inventory solely under 50,000 sq. ft. Moreover, the demand was well distributed: net absorption for office and retail grew by more 100% apiece YOY; and industrial demand increased by more than 50% over the same quarter last year. These demand trends demonstrate that the Main Street USA economy is expanding: i.e., that small office-using firms are hiring; that the utility of smaller warehouse/distribution and flex buildings is largely undiminished by big supply chain and logistic facilities; and, similarly, despite formidable online sale trends, neighborhood shopping and strip centers still fulfill important needs for everyday items like groceries and personal care products and services. Meanwhile, even though deliveries of new construction projects have jumped in selected metro areas in response to the elevated demand, overall supply remains subdued. Over the past three years ending this June, deliveries of small cap buildings averaged only 15.5 million sq. ft. per quarter across the three major property types. By contrast, new construction put in place averaged 67.4 million sq. ft. per quarter at the height of the market between 2006 and 2008, or more than four times the recent rate of deliveries. As a result, the overall (combined) vacancy rate of 5.3% has tapered to its lowest level in at least 11 years, comfortably seated 120 basis points below the prerecession low of 6.5%. All three sectors have plumbed new depths with vacancy rates for industrial (-190 bps), retail (-90 bps) and office (-50 bps) all beneath their respective nadir in the previous upcycle. Given the above, rents are advancing at a fast clip and are within a stone's throw of peak levels attained in 2008. The takeaway here (with far less than 1,000 words) is that within a historical context these are stunning second quarter results that provide fresh affirmation for small balance lenders and investors that core market fundamentals are not only sound and supportive of current levels of transaction activity but also show plenty of momentum entering the second half of the year.